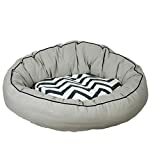 Orthopaedic Memory Foam Dog Bed (XL Grey, 100 x 70 x 35cm). With 8cm Memory Foam on 2cm Solid Foam. For Arthritic Labrador Sized Dogs Or 2 Smaller Dogs. Orthopaedic dog beds are ideal for elderly dogs, or dogs that suffer with joint problems such as arthritis. 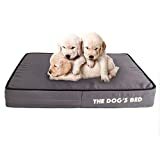 This article gives you information and advice when choosing a dog bed. What are Orthopaedic Dog Beds? 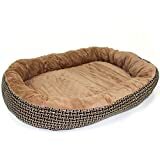 Orthopedic dog beds offer greater support than regular dog beds, and provide extra comfort. They relieve pressure on your dog's joints and posture by giving your dog orthopedic assistance. When a dog suffers from the aches and pains from problems like arthritis, they can be in a lot of discomfort. Therefore they will need as much comfort as possible, to help take the pressure off their bodies. Orthopaedic dog beds are often made from a clever material called "memory foam", which contours itself to the shape of the dog's body, allowing for great support for joints and bones. A good night of sleep is important for any dog, especially one that is suffering from aches and pains. This is where orthopedic dog beds come into their own. The size of your orthopedic dog bed is important. 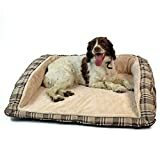 It obviously needs to be big enough for you dog, with a little extra room in case they like to stretch out whilst they rest or sleep. You might want to choose an orthopedic dog bed with a cushioned border. This can help your dog stay in it's bed when it's asleep, rather than rolling out and struggling to get back in! Orthopaedic dog beds with borders normally have an entrance which has no border, so getting in and out is easier. Many orthopaedic dogs beds are square or rectangular, but nowadays you will be able to find them in a variety of many shapes. This is entirely up to you! Dog beds with washable covers are popular at the moment, making them easy to clean clean and hygienic. Orthopaedic dog beds are a must have for older dogs or dogs who suffer from aches and pains.